I have been reading in the glassBYTEs.com™ forum about the debate between one man and two man sets. This is a ticklish issue because part of our industry is concerned about margins and profits and others are worried about safety and quality. How does one handle this sort of issue? Well I hate to disappoint anyone but I support both sides. This issue is truly the perfect subject to put in my “Versus” articles. Why? Because I want to try to explain both sides and then offer some ideas on how we can come to some consensus. Here we go. Anyone who knows me knows that I care about safety. I care about safe installations for our customers and safe working conditions for our technicians. I was asked on the forum if I think that two man sets are better than one man sets. The simple answer is yes. Of course the problem is that in many cases, the shop owner cannot recoup the costs related to two man teams, either because of competition or because of the inability to pass on the higher cost. Would the owner prefer the two man teams? I am willing to bet that he does, but circumstances can prevent the implementation. If there are a variety of suppliers for glass replacement services in your area, it is in the best interests of insurance companies to continually challenge vendors to do the work for less. The reality in competitive markets is that one vendor is usually played against the others to lower costs. For any shop to be competitive, it takes a concerted effort on the part of the shop owner to find a way to meet those demands. I remember the day I started as an installer. I was told that as soon as I could install by myself I would get a raise and a truck to take home. It was a big deal back then because the company I worked for had just switched from two-man to one-man trucks for mobile installation and delivery. I tried for weeks to learn how to set the glass. I broke at least one glass per day and one day I broke three. I thought for sure I was going to be fired, but my fellow installer said that my employer could easily cover my breakage costs because they were saving hundreds of dollars going to one man trucks. Sure enough, I eventually learned to install glass without breaking it and the rest is history. When I was learning to install glass, companies actually made a good profit and could easily handle the learning curve. The only materials needed for safe installation were glass and butyl tape. No clips were necessary because back then clips were made of metal and more durable. We didn’t need mouldings because mouldings were made of heavy chrome and never damaged upon removal. Those were truly the good ol’ days. Today, shop owners have to watch every dollar and how it is spent. If the owner can get an advantage with a tool, a procedure or additional training, they will. However, to stay in business you need to beware of pitfalls. The advantage of a one man installation is the significant reduction in labor costs. The disadvantages can be many if precautions and equipment aren’t put into place to compensate for the elimination of a second man. I encourage all shop owners to complete a cost analysis to determine if their savings are truly worth it. 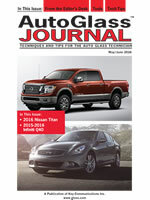 In many cases, glass shops dedicate themselves to one man trucks and end up incurring long term costs that eat up all the savings they think they’re getting. 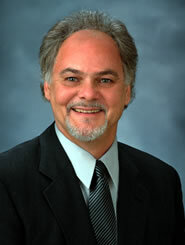 My friend and colleague Rick Nelson shared with the readers on the forum an interesting Health Hazard Evaluation (HHE) study put forth by Center for Disease Control (CDC). In the study it shows that the act of installation is more taxing and detrimental to the body that many would think. Should we rethink two-man sets? I will let you make that decision for yourself. I will not make additional comments on it here because I think it should be interpreted by the reader. I have included the link for your evaluation. In summary, I have a few suggestions that have proven to be successful. One is to increase the percentage of shop jobs. This allows others to help in setting the glass and increase profits by increasing the jobs per day. 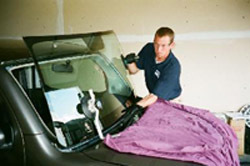 Explain to the customer that their windshield is large and awkward to set with one technician and that the quality of installation will be greatly improved by bringing it into the shop for replacement. Another is to use temporary help during your busy season. Try hiring high school juniors and seniors that may be interested in a job for the summer with the possibility of hiring them full time upon graduation. If they work out during the summer and they are interested in making auto glass a career, you already have them partially trained. Finally, do the math. Really sit down and put a pen to the real costs of one-man versus two-man sets. You may be surprised at the results. And, you never know, you may be instrumental in reducing the unemployment rate in your state and making more profit for it. I shouldn’t have to convince any of you which is the better bead application for auto glass adhesive, but just as I thought that every one used the “V” bead, here comes a video to prove that the round bead is alive and well in the realm of auto glass installation. The video I’m talking about is the video that has been broadcast by KVOR in Sacramento on the program Call Kurtis Investigates http://www.safewindshields.com/. In it, the installer uses the round bead and the technique of holding the gun above the pinchweld and laying it in place as a means of applying the urethane to the vehicle. It is for “show” and not for the good of the installation. I have seen this all over the country and the technique is meant to impress the watcher and, as misguided as it is, to show how talented the installer is. The history of round beads goes back before the windshield’s role changed in 1973. In the good ol’ days, there was no urethane, only butyl tape. Butyl tapes were sold in round and rectangular shapes. Most installers at the time used the round shape because it sealed better and water leaks were less likely to occur. Then, when urethane was introduced in tubes with tapered cone-shaped tips, the obvious dispensed bead would be round. 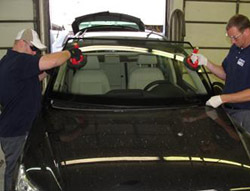 Once the urethane adhesives became the norm in auto glass adhesion, the proper application procedures were then taught from vehicle manufacturers, adhesive manufacturers and training professionals. Adhesive manufacturers even started putting pre-cut “V” tips in with their products. That didn’t stop the old timers. They just cut off the tip down to the round portion of the tip and applied their round bead just like before. No matter how much you told them that the “V” bead was better, they didn’t want to hear it. I remember a training course I gave where one of my students demanded that the round bead was better. He said he had done hundreds, if not thousands, of installations with round beads and “he never had a problem.” Sound familiar? He even bet me a beer that his way was better than the “V” beaded. Well, you know where this was going. During the hands-on portion of the training, we tried my way of applying the bead and his way. Then we water tested the installations and, lo and behold, his installation leaked in three spots and mine did not leak at all. He also used almost twice as much adhesive as I did. That beer sure tasted good. The “V” bead is almost a fail-safe way of applying adhesive. As long as it is high enough it can be wobbly or crooked, but if the tip touches the underside of the glass, it will seal and bond. Plus, the triangle morphs into a perfect sealing rectangle when properly decked. 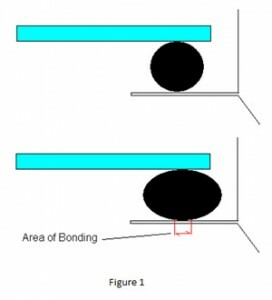 The most important part of using a “V” over a round bead is the increased bonding between the two surfaces. Let me illustrate with some relatively simple pictures. When a round bead is used the round shape can only be made into an oval shape. 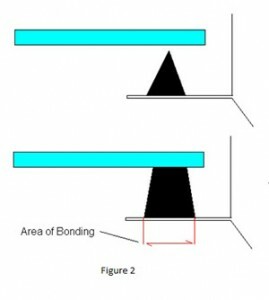 Notice the area of bonding on figure 1. The “V” bead when applied maximizes the bonding area and does not change with the pressure of decking. Notice the area of bonding on figure 2. Here are the procedures for applying urethane to either the glass or the pinchweld. Cut or adjust the “V” bead to the proper width and height. Cut the tip to be the width of the existing OE urethane bead. Do not cut the tip at a 45 degree angle. This will not allow for proper application. Cut the “V” equal to and slightly greater than the height of the wall of the pinchweld. Use the top “L” shaped pinchweld to make your measurements. The side (“A” pillar) pinchweld is not consistent and may give you a false measurement. If you are applying the bead to a clipped moulding style vehicle, cut the “V” bead equal to or slightly higher than the height of the clip. Then set the glass and use the mouldings as a measuring device and decking device at the same time. While you push down with the mouldings to engage the clip you are simultaneously decking the glass to the proper height. Once the clip is engaged, stop pushing down on the glass. This will eliminate a gap between the glass surface and the moulding. Apply the urethane with the caulk gun positioned 90 degrees to the surface (perpendicular). 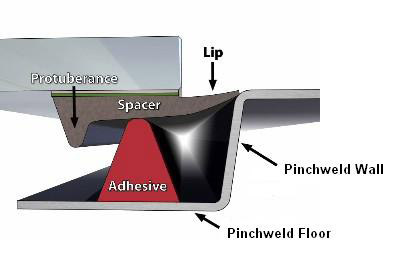 This causes the adhesive to be applied to the surface and not laid on the surface. 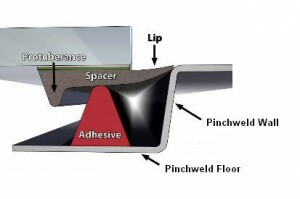 Laid adhesive can cause leaks because it can bridge gaps or depressions on the surface. Applied adhesives assure that any imperfections on the surface are filled and the “V” is facing upward ready for the next surface to meet it. Before setting the glass make sure that any seams caused by the application are paddled together and a “V” shape is replicated. If you out there are still using the round bead, stop. I guarantee that your callbacks will be reduced when you properly use a “V” bead application. I think that it goes without saying that shop installations are better than mobile installations for a number of reasons. However, many feel that mobile installations are a necessary evil because mobile service is a luxury expected by our customers. That expectation can be changed if handled correctly. It has been done in the backyard of some of the biggest national players in the industry. First, I would like to discuss the benefits and the drawbacks of mobile versus shop installs. I’ll list benefits first and then the drawbacks. Add them up for yourself. Benefit – Customer convenience is by far the best benefit when it comes to mobile installs. The customer can go about their day and the mobile technician can go where the vehicle is. This is a big selling point. Benefit – Your truck is a rolling billboard that tells the world who you are, what you do and where to get what you sell. Take advantage of your mobile truck by displaying your telephone number and/or website prominently on its side, entering it in local parades, driving different routes to expose it to different possible customers and keeping it clean and well maintained to show professionalism. Drawback – Outfitting a mobile unit is very expensive. Go ahead and add up the cost and expenses; truck, fuel, insurance, special tools, power source, maintenance and finding a tech with a good driving record. These things add up and to make things worse, you cannot charge extra for the service. If there is a callback and you have to go out and fix a problem for no cost, then the loss is even greater. Drawback – Every time the driver does something wrong like drive erratically or offensively, it reflects on you and your business. Drawback – Mobile installations are susceptible to adverse weather conditions that can cause installation backups and missed appointments that can upset customers. Drawback – Contamination is a condition that must be addressed. Flying around in the air is debris that will not be conducive to a safe and contaminate free installation, so care must be taken to eliminate as much as possible. Drawback – The number of installations in a day are reduced due to traffic, weather, time constraints and unforeseen circumstances. Drawback – Productivity will suffer unless very good routing practices and tools are used. GPS tracking, appointment setters and email reminders will have to be implemented to assure timely and productive scheduling. Benefit– A “bricks and mortar” building gives the customer a sense of stability and legitimacy. It gives them a place to go when things go wrong, questions need answering or more glass breakage needs fixing. Big benefit – Controlled conditions mean less contaminants interfering with the installation safety, weather conditions are not a concern, scheduling can be easily managed, more paid work can be done in less time, tools can be shared for less cost, there is usually help available for setting large or difficult windshields and there can be more eyes, ears and experience to solve problems. Benefit – Management oversight is another big benefit that can mean higher quality and more productive work. When a technician leaves the building he is almost completely self-managed. Your businesses success is dependent on how that technician handles himself with customers, the fellow citizens he encounters and how he does his work in the field. The overhead involved with buying a building or paying rent—keeping the lights on. The features and benefits of mobile versus shop are undeniable, but how can I change my market? I have been saying forever that the customer calls the glass shop for information, not a price quote. Sure, the first thing they ask for is a price quote, but that is a question that everyone asks when they don’t know what else to ask. You have to give them a reason to ask questions and begin the conversation. Once the Q & A turns to safety and they ask what is better, “mobile or shop installation”, the answer is obvious. Believe me when I say, you will be surprised how many would rather bring it to the shop for installation instead of mobile when given the chance to choose. I am not saying that you completely give up mobile service. Only reduce the percentage of business and get the majority on the shop side rather than the mobile side. It can be done.